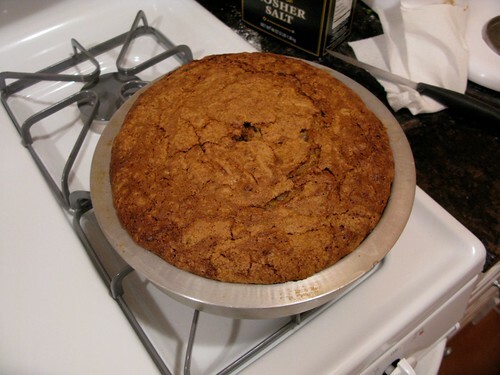 It’s olive oil zucchini cake, timid-voiced person! 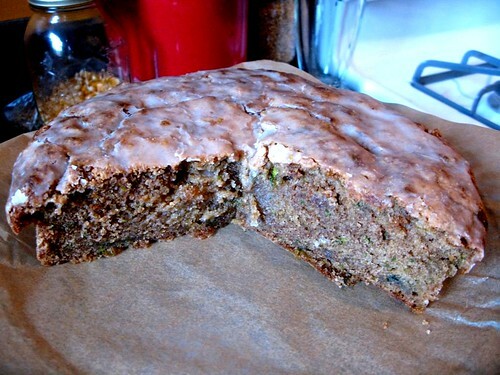 Or, rather, zucchini olive oil cake. It comes from Babbo pastry chef Gina DePalma’s book “Dolce Italiano” and one bite will make a convert out of you. It’s moist, it’s got terrific fall spices (cinnamon? check. ginger? you got it. nutmeg? who’s your daddy?) and there’s a “lemon crunch” glaze on top that’ll make you pucker your lips in delight. Craig’s friend Alena was dubious at first, but after one bite she declared “this is AMAZING” and asked for a second piece. The defense rests. The only tweak I made was I left out the walnuts; not because I’m allergic or anything, just because I was trying to save a little money (they were $5.99 at the store) but I bet this cake would taste even better with them. Also, I’m an advocate for using whole nutmeg that you grate yourself: maybe it’s a subtle difference, but God is in the details of subtle differences. That’s the saying, right? And so, without further ado, your weekend baking project: Gina DePalma’s Zucchini Olive Oil Cake. To make the cake: Preheat the oven to 350 and position a rack in the center. Grease a 10 cup Bundt pan [I just used a regular cake pan] using nonstick cooking spray or butter, then dust it with flour to coat it completely, tapping out the excess flour. Place the walnuts in a single layer on a baking sheet and toast them until they are golden brown and aromatic, 12 to 14 minutes. Cool the walnuts completely, then finely chop them in the food processor and set aside. Sift the flour, baking powder, baking soda, salt, and spices into a medium bowl and set aside. In an electric mixer fitted with the paddle attachment, beat the eggs, sugar, and olive oil together on medium speed until light and fluffy, about 3 minutes, then beat in the vanilla extract. Scrape down the sides of the bowl with a spatula after each addition. Beat in the dry ingredients all at once on low speed until they are thoroughly combined, then switch the mixer to medium speed and mix for 30 seconds. 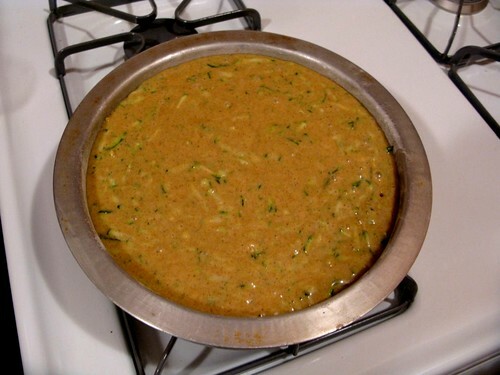 Beat in the zucchini and the walnuts on low speed until they are completely incorporated, scraping down the sides of the bowl. Bake the cake for 45 to 50 minutes, rotating the pan halfway through the baking time to ensure even browning. The cake is done when a tester inserted in the center comes out clean and the cake has begun to pull away from the sides of the pan. While the cake is baking, prepare the glaze: In a medium bowl, whisk together the lemon juice and granulated sugar, then whisk in the confectioners’ sugar until the glaze is completely smooth. Allow the cake to cool in the pan for 10 minutes, then carefully invert it onto a wire rack. [At this point, I flipped it on to ANOTHER wire rack so the top of the cake (which was nice and crusty) was the part that I glazed] Using a pastry brush [I used a metal spatula] immediately brush the glaze over the entire surface of the warm cake, using all of the glaze; it will adhere to the cake and set as the cake cools, Allow the cake to cool completely and the glaze to dry completely. 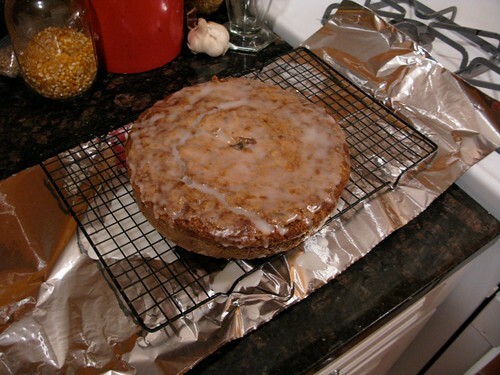 Transfer the cake to a stand or sering plate and, if desired, lightly dust it with confectioners’ sugar. Any leftover cake may be wrapped in plastic and served the following day.